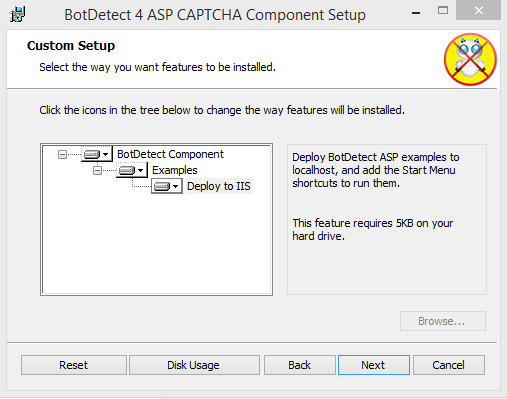 The >BotDetect ASP Classic Captcha installations include a number of code examples which can help you get started with integrating BotDetect in your Classic ASP applications and configuring various Captcha options. Selecting Examples installs the BotDetect web application files – demos and samples source code. Selecting Deploy to IIS deploys the BotDetect web applications to localhost, creating IIS applications running in a separate application pool. If setup detects that you don't have IIS and .NET Framework version 2.0 or newer (required since the Captcha COM component used for Captcha image and sound generation is a .NET component) installed on the machine, the Deploy to IIS option won't be shown. Integration code examples show how to integrate BotDetect in your ASP applications. This code example shows the most basic source code required to protect an ASP form with BotDetect Captcha and validate the user input. This code example shows how to add BotDetect Captcha protection to a typical ASP form. This code example shows how to add BotDetect Captcha validation to simple ASP login forms. This code example shows how to configure Captcha challenges by overriding Captcha library defaults in application configuration files. This code example shows how to configure Captcha challenges by setting Captcha object properties in ASP form source. This example shows how to dynamically adjust Captcha configuration, potentially on each Http request made by the client. Any ASP code setting Captcha properties in the CaptchaConfig.asp file will be executed not only for each protected form GET or POST request (like Captcha configuration code placed in form source would be), but also for each each GET request loading a Captcha image or sound, or making an Ajax Captcha validation call. If configured values are dynamic (e.g. BD randomization or other function calls in CaptchaConfig.asp code), they will be re-calculated for each Captcha challenge generated. For example, Captcha ImageStyle randomized in CaptchaConfig.asp code will change on each Captcha reload button click. This means your code can reliably keep track of visitor interaction with the Captcha challenge and dynamically adjust its settings. Also, while CaptchaConfig.asp settings apply to all Captcha instances by default, you can also selectively apply them based on CaptchaId. To show an example of the possible dynamic Captcha configuration adjustments, this code example increases the difficulty of the Captcha test if the visitor associated with the current PHP Session fails a certain number of Captcha validation attempts, and also sets the Captcha locale to Chinese for requests from a certain IP range. This code example shows how to use the BotDetect Troubleshooting helper to debug Captcha issues. This helper can help diagnosing and resolving any BotDetect issues you might encounter on your servers.